First off, thank you all so much for the lovely comments on my book giveaway post! I love reading each and every one. And, there’s still time to comment on that post, if you haven’t done so already, and get a chance to win “my” book and a lovely bundle of Hawaiian fabrics. On to other fun stuff. I’ve been having my own little quilt along here with the Aloha Pineapple quilt, but I also found another quilt along I couldn’t resist. Cherry House Quilts was making a simple, striking, small, quilt that just plain appealed to me. The small size meant that if I could find appropriate fabrics in my stash, I could join the quilt along without disrupting all my other projects (too much). All the little squares are from my scrap bins — I just kept grabbing pieces until I had enough, not paying tooooooo much attention which, or how many, colors I had. Only one square from each fabric though, so it’s kinda like a charm quilt. Then I laid all the squares out and rearranged them until I liked the columns. There’s some stuff in there you wouldn’t intentionally put together. 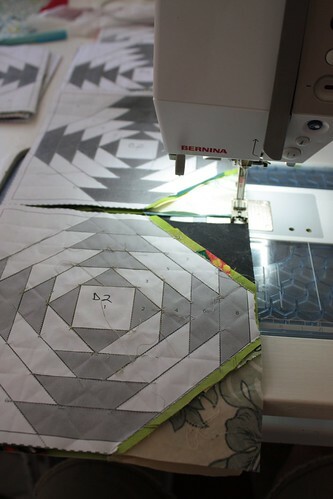 Cherrie’s example had straight line quilting, which looks great, but I knew I could do that. So, I decided i’d try something still geometric, but with a little contrast. I drew the center circles (sort of evenly distributed all over the quilt) with a water soluble marking pen and then carefully followed the line with the walking foot. For each successive circle, I lined up the edge of the foot with the previous line. 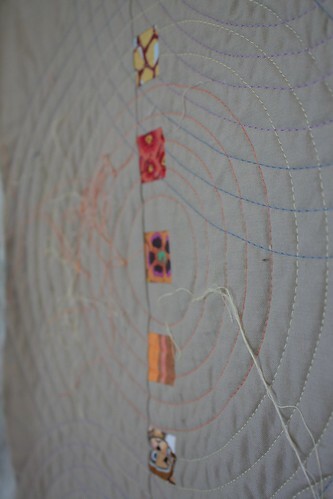 As the circles got bigger, and the curve less extreme, the quilting went easier. Of course, pulling the quilt, even gently, around those curves resulted in some distortion. I basted with safety pins, so maybe this would be the kind of situation where spray-baste would be more appropriate. I switched thread colors every 3 to 5 rounds. 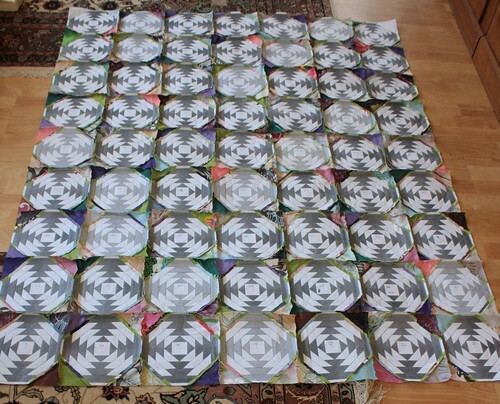 I also worked on all the circles at once, adding rings all over until I liked the sizes and overlaps. I did not plan at the outset how large each one would be. So, there’s some puffs and a few unsightly tucks, but it’s all part of the learning process. Thank you for taking the time to read my blog. And for coming back and reading again, and for commenting. Thank you for writing your own inspiring blogs for me to read too. Thank you for encouraging me in my endeavors. And thanks for including me in swaps and challenges. Without such enthusiasm and interaction, I would never have had the opportunity to be a part of Twelve by Twelve, and certainly would not have had chance to co-author a book! So, to say Thank You, Mahalo, or Danke Sehr, I am giving away a copy of said book, Twelve by Twelve: The International Art Quilt Challenge. And as an added bonus I’m including this cute little fat quarter bundle of Hawaiian themed fabrics* I picked up while on the Big Island last week. I’ve been contemplating what I would like readers to do to win this fabulous giveaway, but then I decided that just showing up is more than I ever asked for when I started this blog. So, leave a comment — maybe about your favorite quilts, or maybe about a memorable place you’ve traveled to, or perhaps a project you’d like to try. Really, any comment will do. I will randomly choose a comment on Friday night (Hawai’i time) to receive both the inspirational book, and the fun tropical fabrics (no joke!). It’s like a big fruity drink with an umbrella, but without any guilt! *Longtime readers (and maybe short-time readers too) have hopefully figured out that I run a rather scattered blog here, bouncing from “serious” art quilts, to forays in contemporary patchwork, to kid-centric cute and craft, and all with a healthy dose of travel and cultural exchange. So, it should come as no surprise that, although there’s no modern pink hawaiian anything in the Twelve by Twelve book, I still find it appropriate to include some local style kawaii in my giveaway. If anyone is curious, the top fabric is a typical graphic hibiscus print, then there’s the pink colorway of the same cute fabric I used to make pajama pants for my nephew last Christmas, and then a pink version of palaka (plaid) historically used in plantation workers’ shirts, and on the bottom is another graphic floral, this time on a white ground. 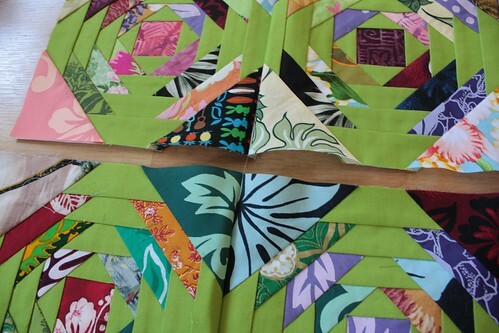 Aloha Pineapple Quilt Along: quilting along! Not exactly Part 7, but I wanted to share some more pineapple blocks. I like how the limited color palette allows her to mix up the arrangement of the lights and darks in each block and have it still look very cohesive. On the other end of the spectrum is Laura’s free pieced and polka dotted Loco Piña! If Betsy Johnson and Freddie Moran made a quilted collaboration, this might be it! Laura was a little apprehensive in including her version with the rest of the group, but I just love how it shows that there’s a lot of leeway in these traditional blocks. You can be as controlled or as crazy as you want. It’s all good! 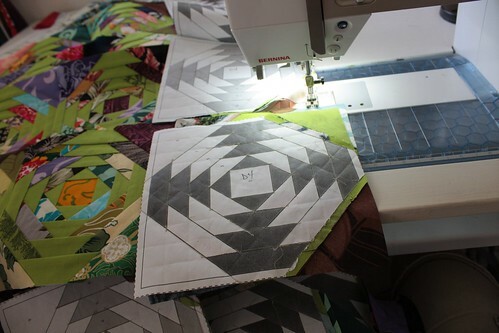 Mahalo DianeY and Laura for Quilting Along with us, and for allowing me to share your quilts in progress! Oops, it’s been another long stretch, but perhaps that’s been enough time to complete the pineapple blocks. I had a big push this last week and completed the last two this morning. As of last Monday, my students had the finish in sight as well. Jason had completed the 80 he wanted to make, Katie only needed to make a dozen more, and Lynn was completing her final two. This is a good time to put a new needle in the sewing machine. All that sewing on paper foundations dulls a needle. 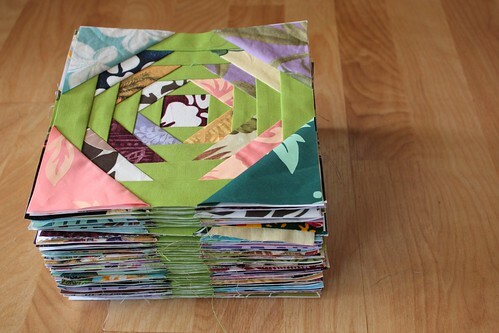 Once the blocks are done, sewing them together and adding borders will go much smoother with a sharp needle. 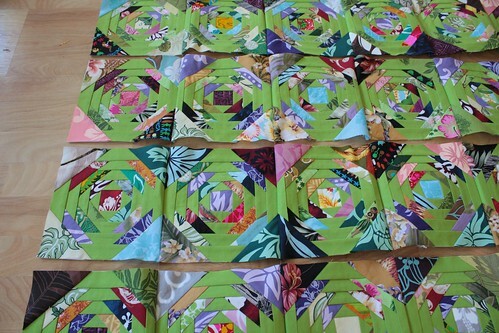 With all the pineapple blocks done, the next step is to sew them together. First, lay them all out on a design wall (big piece of batting or flannel pinned, or otherwise attached to the wall) or on the floor. Make sure you like the placement of your blocks, rearranging or rotating them as necessary to make sure the colors are evenly distributed (like mine and Jason’s), or that you have a regular pattern (like Katie’s and Lynn’s). Flip all the blocks over and mark the paper on the backs alphanumerically so you can keep track of the rows (A, B, C, etc), and the columns (1, 2, 3, etc.). Now you can make each column a stack with the As on top. I like to chain sew my blocks together because: a) not cutting the threads between blocks makes for tidier sewing and less thread wastage; and b) leaving the blocks linked makes it easier to keep track of their order and makes sewing the rows together a snap. At this point, I gently tear off the large corner pieces of the foundations just before I sew each block. I do this so that the blocks feed more smoothly through the sewing machine and so I don’t have so much of that little seam allowance bit of foundation to tear off later. Do keep the rest of the foundation though as it has your numbering system on it, and it keeps the blocks stable as you are sewing. Place block A2 face down on top of A1 and sew them together with the usual 1/4″ seam allowance and a slightly smaller than usual stitch size. Without cutting your thread, sew off the end of the A blocks and continue sewing onto blocks B1 and B2 (right sides together). Continue chain piecing with blocks C1 to C2, D1 to D2, etc. until you’ve sewn all your 1s to all your 2s. Now you can remove the chain from the sewing machine, or sew onto a scrap and then cut the chain from the back of the scrap. Backstitch at the start and end of each column for more stability. No need to backstitch on each and every block. The paper foundations do have two drawbacks: they are heavy and stiff. This makes them a bit cumbersome to sew. The benefits outweigh the hassle though. Just keep your chain in your lap and support the blocks on your sewing table if gravity takes over and they pull against your sewing. Return to the top of the 1 and 2 columns you’ve just sewn together and add the 3s. Sew A3 to A2, keep the chain intact and sew B3 to B2, continue sewing, adding C3 to C2, and so on until you’ve added all the 3 blocks. Snip the scrap from the top of the column and now sew onto it at the bottom. Snip the column from the scrap and return to the top of your growing quilt and sew on the column of 4s. 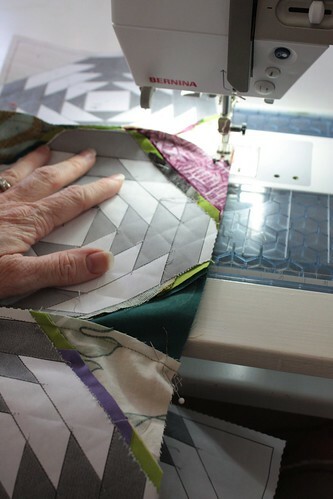 Continue on this way until you’ve sewn on all your blocks. I had seven columns in all. Depending on the layout you’ve chosen, you might have more, or less. 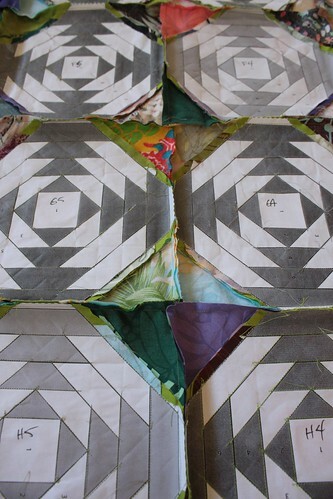 With all the columns sewn together, you end up with tidy rows of blocks like the photo above. Look closely at the photo below to see the thread “chain” holding the rows together (now you can’t accidentally swap the rows or flip them over!). 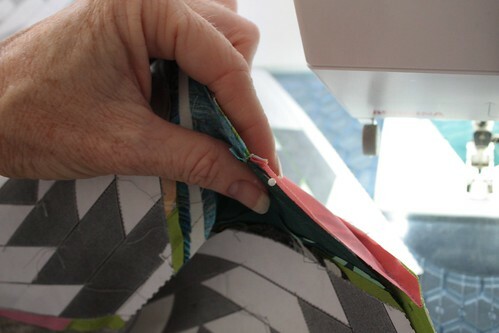 When I’m sewing rows together, I like to press the seams of one row in the opposite direction of the next row. The problem with these foundations though, is that all that toner from the foundations will end up on the bottom of your iron. Blech! You could remove the paper now, since everything is in place and you no longer need the alphanumeric prompts, but all those scraps can have stretchy bias bits, and with this many blocks, the quilt wants to throw it’s weight around. I found that it was enough to pin mindfully and keep the stability of the paper. So, fold row A face down over Row B and pin where the seams between blocks meet (ignore the seams within a block). Make sure that all your A seams face in one direction and all your B seams face in the other. 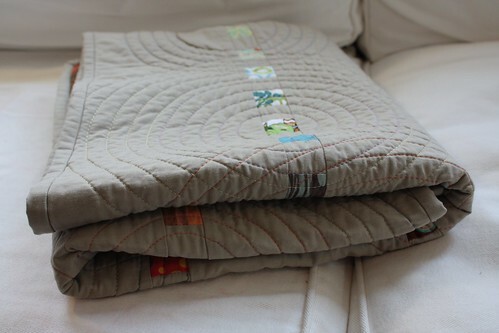 Note that the seams nest against each other to make a tidy and not-too-bulky join. 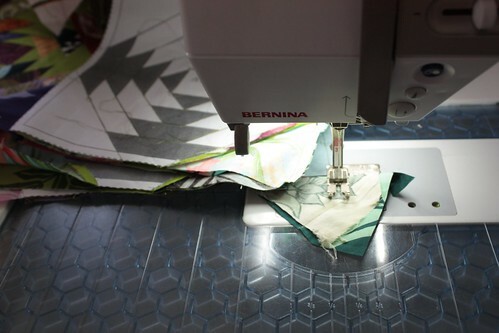 Place the pins at an angle so that you can sew all the way onto the intersection before you need to remove each pin. Once Row A is sewn to Row B, fold B onto Row C and pin and sew again. Continue until all your rows are sewn. A little backstitch at the beginning and end of each row is good to keep the ends from pulling apart. And, voilá! Here’s what the back of your quilt top should look like now. Put on a good movie, turn on the radio, or fire up a book on tape, and pull off the rest of the foundation papers. This can be tedious, but it’s not hard. I think I’ll take mine to class and pull out paper while I’m talking to my students. The next installment will be about borders. We’ve got some good stuff in the works which I hope will be far enough along to show after Monday. 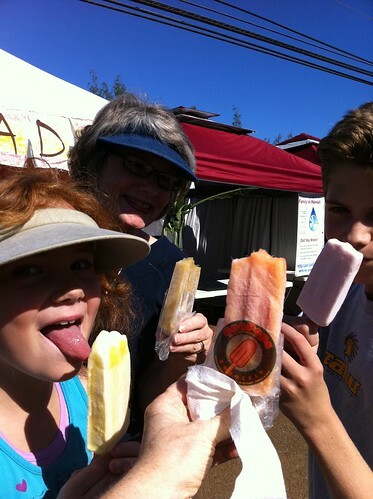 I had been hearing through the local foodie blogs and the newspaper how yummy Ono Pops were, so when we saw the tent at the Haleiwa farmer’s market today, I dragged the family over and insisted we try some. And yes, they are delicious! Left to right are Lilikoi 50/50, Green Gingetanical, Pineapple Li Hing, and Creamy Pink Lemonade. Remember 50/50 bars with orange on the outside and vanilla in the middle — that’s the basis of the Lilikoi 50/50, except that it’s been island-ified with lilikoi (passionfruit) sherbet on the outside and homemade vanilla ice cream on the inside. Sweet, creamy, and a little tangy, I can’t think of anyone who wouldn’t like this popsicle. With all the outrageous flavor combinations, my mom decided she’d go all the way and try the strangest. It’s made with the unlikely combination of fresh ginger, honey, thai basil, sea asparagus (AKA sea beans or glasswort for Chopped and Top Chef fans), lime, and maybe a few other interesting ingredients we can’t remember. It was very gingery and herby, not too sweet, very unusual. Weird, but good. Also on the menu was a Yellow Gingetanical which replaces the fresh ginger with candied, the honey with cane sugar, and the lime with lemon. The funny part though is that Ono-maker Josh said these two flavors were inspired by the liqueur Chartreuse!! I’m not clear as to whether he was under the influence of Chartreuse while inventing these pops, or if it was just the color he was emulating, but I thought it was an interesting coincidence that Chartreuse would pop up during our Twelve by Twelve Chartreuse challenge! What are the chances? Pineapple Li Hing was a must for me since I am on a mission to try Li Hing powder in all it’s applications. This is far and away my favorite! Cold and pineappley with a hint of sweet sour salty to cut the acid and give some depth. You can give me Li Hing in Ono Pop form any day! Finally, my lover of pink lemonade chose the Creamy Pink Lemonade pop. It must have been good as his was finished first. The Pop maker said it’s a bit tricky to achieve the right balance of creamy and tart, but I think he’s done a wonderful job. If you like pink lemonade (and who doesn’t?) you’ll enjoy this popsicle. There’s even a vegan chocolate apple banana pop, but we couldn’t convince the vegan member of our group to try it — too soon after breakfast. It’s been a few weeks since the last check in and everyone except me has been very industrious. Today we talked a bit about borders. Borders are an interesting thing. 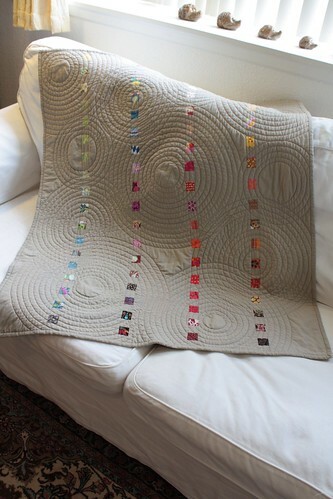 Many a traditional quilter thinks that a quilt is not complete without a border. And many quilts are not. But borders are not always necessary. With our traditional Pineapple Log Cabin design, borders are a nice way to enhance the colors, frame the design, and add a little size if needed! I brought examples of quilts with no borders, plain borders, thin and thick multiple borders, borders of half square triangles (since most of my students are already familiar with this block), and piano key borders. My idea in presenting all these options is to get us thinking about what we each want for the next step in our project. Our next class is in two weeks and I’m excited to see what ideas (and fabrics) everyone comes back with after mulling this over for a while. I’ve been very lethargic, and not made any blocks. However, Deb and Kathleen previously of one block each, now have quite respectable piles! 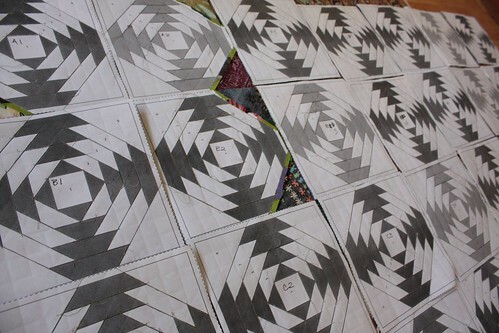 Deb is aiming towards a slightly smaller 5 block by 7 block quilt with a large border. She loves the hawaiian laua’e design and has featured it strongly in her fabrics, so I thought it was natural to showcase the design in the border. The white fabric is what she had on hand to test the idea. She’ll be shopping around for the perfect fabric — maybe a yellow one…. Kathleen is going to push herself to make the intended 63 blocks. Here’s what she had last week, and she had twice as many today, so we’re confident she’ll make her goal. She’s got a nice watery feel going on here, like a tank of tropical fish. Jason is powering away on his 8 x 10 block Ode to the Aloha Shirt. He’s over half way there. We auditioned multiple borders for him. He likes the way the butterscotch border extends the pineapple design, and we’re excited about the possibilities of the turquoise fabric that he’s used for his block centers. I could also see a wonderful, scrappy piano key border on this one with more of the shirt fabrics. 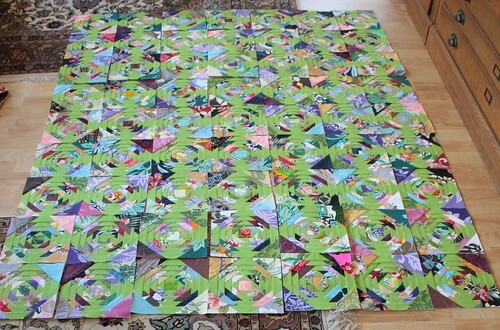 Katie’s jewel of a man quilt is progressing as well, but I don’t have any new photos. Lynne stopped by for a few minutes but didn’t stay to sew, so I’m not sure where she stands. Though, last week she was having fun using cute little bunnies and kitties in her centers! Her quilt is going to be such a warm and wonderful gift. This is where I’m spending the day. I knew I was ready for some down time, and the kitty gladly obliged. Apparently my author copies of “Twelve by Twelve: The International Art Quilt Challenge” were taking the slow boat to Hawai’i, waiting for the official release date of the book. So now there’s no more waiting! Everyone can go get a copy of our book too. You should definitely check with your favorite Twelve to see if they are selling or giving away copies (signed if you want). I’m sure I’ll do something here on my blog sooner or later. I was actually surprised at how hefty the book is! There’s a lot to digest in there. Pictures of all our theme series quilts, insight from each artist, tips, and peeks at our work spaces too. A few reviews to read are by quilters and art quilters, Virginia Spiegel, Pat Sloan, Rayna Gilman, and more to come.